We stock genuine issue army surplus - new and issued. Our range of products includes camouflage clothing, uniforms, footwear and equipment. Camouflage clothing is available in MTP (Multi-Terrain Pattern) PCS and CS95, DPM (Disruptive Pattern Material) - Woodland and Desert. 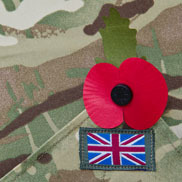 PCS - Personal Clothing System - the current British military combat uniform - issued from early 2011. CS95 - Combat Soldier 95 - being phased out and stocks will become increasingly harder to find.